Application of sodium ferrate (Na2FeO4) is considered as the environmental friendly and cost-effective method for oxidation, coagulation and disinfection processes of water and wastewater treatment. Even though many methods of Na2FeO4 production have been proposed, they are still a challenge for the production of large Na2FeO4 quantity. 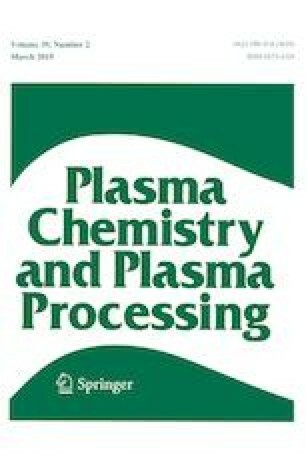 This study aims to verify the optimum operating conditions of Na2FeO4 production by solution plasma process (SPP) of using both anode and cathode made of low-carbon steel placed in electrolyte solution with a distance of 3 cm. The results showed that the efficiency of Na2FeO4 production by SPP that does not obey Faraday’s law is higher than that by conventional electrochemical process. The optimum operating conditions of SPP were verified in 16 M NaOH solution at 30 °C and imposed by 35 V of the voltage while the maximum concentration and the average particle size of the Na2FeO4 production as high as 14.7 mM and 35 nm, respectively, were verified. The maximum current efficiency of 512% and the minimum energy consumption of 6 kWh/kg were verified for the formation of Na2FeO4 during 2 h due to an increased activity of OH− ions. A new approach of large Na2FeO4 production has been proposed to support the development of advanced technologies in water and wastewater treatment. The online version of this article ( https://doi.org/10.1007/s11090-019-09989-2) contains supplementary material, which is available to authorized users.